It's hard to hear the stories. The images are sickening. 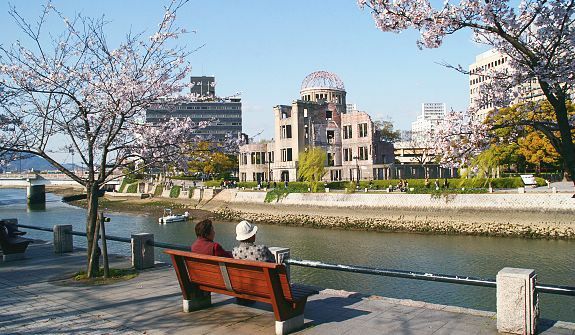 My imagination cannot grasp the kind of suffering the people of Hiroshima endured and even survived. My faith in humanity shakes when thinking of what humans did to each other and to creation. I heard these stories first 10 years ago with a visit to the Hiroshima Peace Memorial Museum, but they are still etched in my memory. They have influenced how I have seen the world since then. I can't look at war, nuclear weapons, pain and suffering the same way. I can't look at the story of Japan and Korea the same way. Looking out the window on the sunset over the gorgeous mountains and blue sky, reflected in the river, my imagination goes to what the sight must have been after Aug 6, 1945. 90% of the buildings had been destroyed. Bodies and fire were everywhere. The river was filled with swollen bodies and thirsty, injured people too weak to swim or climb out. And worse stories. How do we take this in? Why should we? I think all of humanity needs to sit with the reality of this level of suffering. To hold it, feel it, lament it. Then decide how we will live in light of it.